What is the expansion threshold? The 55gr is the best bullet on flesh I've shot, and I've shot most of them. If they didn't significantly reduce velocity at which it expands, I don't see it outperforming 55gr, esp. in 16" (and shorter) tubes. Good stuff. I know federal is also releasing their trophy bonded bear tipped as well. Go ahead and tell us more of your experiences. 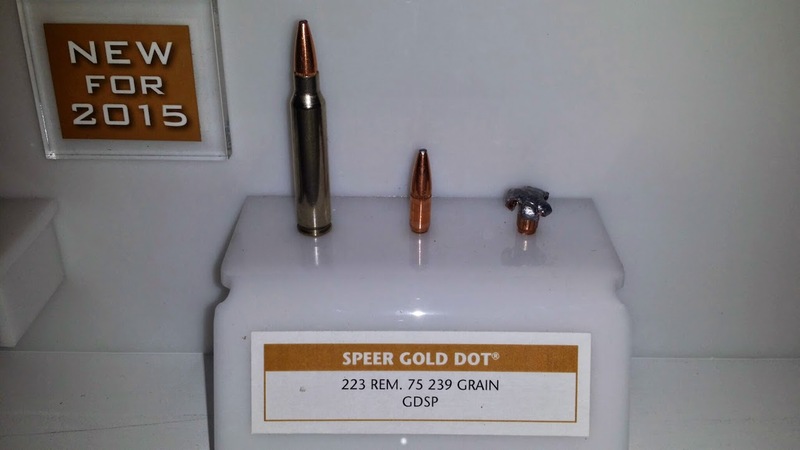 Does it really perform that much differently than the more common 62 grain load? If so, why is 62 grains the standard available offering? Put down the Optic! Learn how to shoot the REAL way! Apologies, I typed 55 (twice! ), but I meant 64gr. Anyone have more info on this round? Cant find anything on it. Tag for update when this comes out. I hope I can afford enough to load 8-10 mags for HD. Really looking forward to buying these as components (pulls or not). DocGKR said he will be testing it soon! I'd wait for his report. Other than that , I can't find any more info either. You should try Fiocchi's 55 grain .223 psp. Expands and does a lot more damage to gel than the fusion round, and still penetrates and holds together well. In fact, it's one of the highest performing .223 rounds I've ever seen! It's definitely worth an evaluation! I wouldn't mind trying some. I have a few boxes of other ammo around to try out now, but we've had so many helicopter hunters poaching that I'm not getting a lot of shots at hogs lately. With the 64gr 223 Gold Dots (Fusion is NOT the same bullet), my son has killed 9 deer, and at least that many hogs, all DRT. So far not a single bullet has failed to exit, one went about 23 inches from right front shoulder to left ham on a pig. This is at distances from 50-200 yards, from 16, 18, and 24" tubes. Conversely, TSX (I've tried 45, 55, and 62gr) has always performed well, and always exits but no DRTs, and less internal trauma than Gold Dots. Core Lokt Ulta Bonded doesn't exit, and Fusion, Hornady, and the OTMs give mixed results; some exits and some not, some DRTs, some not. What tests are you looking at for the Fiocchi round and are you heavily favoring expansion and wound channel over penetration depth (or perhaps recommending a "best value" choice)? I'd love to find a cheaper hd/hunting round than the fusion, but the gel tests I am finding show that 55gr Fiocchi round just barely getting over 12 inches of penetration from a 16 in bbl. with 28 grains holding together- in this test just under 13 inches and 38 grains retained [should be noted an 18.5 bbl in test #2] vs 14-16 inches and 58ish grains retained out of the fusion in gel from a 16 in bbl. Fiocchi 55 gr PSP fired from 16" and 11.5" AR pattern rifles into calibrated 10% gelatin. Both rifles are 1:9" twist rates and both had a Surefire FA556AR attached. BB calibration: 596.1 fps, 3.7"
There are a couple other tests out there, I linked to one below. They key is to look at the distance (50 yard) and SBR (to simulate long range performance) gel tests. Anything will have reduced penetration at point blank range due to the higher velocity, and Fiocchi 55 grain PSP is HOT for a .223 (as fast as M855). Fiocchi has slightly greater penetration depth at distance, only a few inches less than fusion, with a much better wound channel. Demonstrates performance at roughly 200 yards from a 16" barrel, and it shows excellent penetration depth, retained weight (53.5 gr) and wound channel. At any type of realistic engagement distance, the Fiocchi holds together well, penetrates consistently (the SBR had around the same penetration depth as the 16") and has a tremendous wound channel. The only unknown is how well it penetrates through barriers, though since it is a soft point I'd imagine it should hold together better than an open tip round. I'd love to see some follow up tests shooting the fiocchi through barriers. There are a couple other tests out there that I'll try to pull up later. They key is to look at the distance (50 yard) and SBR (to simulate long range performance) gel tests. Anything will have reduced penetration at point blank range due to the higher velocity, and Fiocchi 55 grain PSP is HOT for a .223 (as fast as M855). Fiocchi has slightly greater penetration depth at distance, only a few inches less than fusion, with a much better wound channel. gotcha, yes significantly better results in that link. Will have to try this one out. thanks! The good thing about some of these channels is that they test many different types of rounds side by side from the same platform with the same testing criteria, so you can match up and compare ballistics results. I used to be very pro fusion, but if fiocchi performs well through barriers (esp wood penetration) then I might switch over as the fiocchi is much more impressive terminally. Also, since velocity is the key to penetration through steel, I'd wager that fiocchi has superior steel penetration at much longer ranges than the very slow fusion. I going to bet this is going to be mainly LE only, maybe only popping up for sale briefly every now and then. For civilians like myself, I am not expecting to get my hands on any of this. Looks promising though! Great! My scoped AR is already zeroed with 75 gr. Obviously I would have to shoot a few to see how much departure there is but I can definitely see getting a few boxes. It's probably going to be $1/pop. Exciting. Another heavy for caliber hunting load is a good thing. I have used the Swift Scirocco with pretty good results in this weight but really like the semi- petaled design of the GD better. The wounds tend to plug less with tissue debris in a petaled design. It will certainly be a good round if your shots are a little further out, 300 yards or so. Keep us posted JG. Thanks for the link, hopefully we get some gel tests and reviews soon. That should be a nasty round. I know the 64g GDSP is effective. I have dropped large hogs at 50 to 200 yards , head/Neck shots, DRT. They don't take another step. A friend of mine uses this same round on Texas whitetail and axis with the same results. Our revolution will have been in vain if a Virginia farmer is held in hock to a New York stock jobber, who is in hock to a London banker. The opportunities for corruption would prove irresistible.